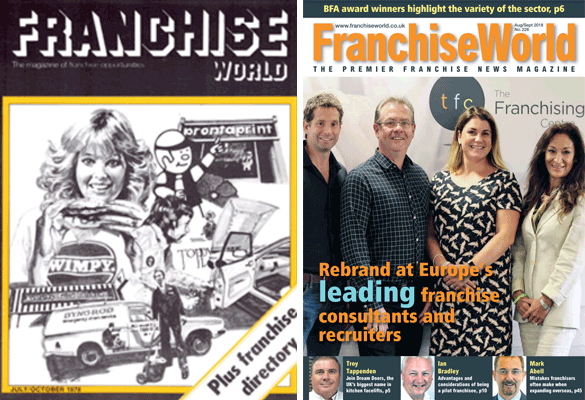 2018 marks the 40th Year of Franchise World, who are the UK’s oldest franchising magazine and seen by many as one of the most newsworthy and informative. “I’m honoured to have been involved with Franchise World and the Riding family almost since the first edition. While at Safeclean I attended the innovative ‘Be Your Own Boss’ seminars but first remember meeting Bob at a franchising event at Wembley where he was in the middle of forcefully explaining the error of their ways to a well-known franchising character. We were thrilled to have been asked to grace the cover of the Aug/Sept 2018 Franchise World issue, and how times (and covers) have changed!